You are here: Home » Flooring Supplies » Finish Applicators » Paint Brushes » Sponge Poly Brush 4"
Sponge Poly Brush 4" is a convenient one handle high density foam brush, great for painting on any surface. It's great for those quick touch ups. 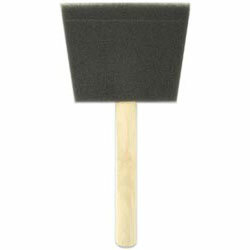 It fits comfortably in the palm of your hand and uses less paint than bristle brushes. Not to be used for shellac or lacquer.